It may seem crazy to buy and hold a stock forever, but it's often the wisest financial move. Companies with a durable competitive advantage can generate value for decades, and the market can be so volatile that timing the ups and downs of stocks isn't a great idea for investors. With that in mind, here are four stocks you can buy and have "forever" as your holding period. There may not be a company in the world that makes a set of products as diverse as 3M (NYSE:MMM). It is a big player in consumer goods with the Post-It Note, electronics with brightness-enhancing films that are probably in the screen on which you're reading this article, and energy with electrical connectors and filtration products. And that's just scratching the surface of what 3M makes. At its core, 3M is an innovation company. Its engineers and researchers spot market opportunities and use hundreds of technologies developed in-house to provide solutions. That's how the company moves into new fields where it doesn't have prior expertise. It literally invents its own market opening. Long-term, 3M's ability to turn innovation into profits and a growing dividend for investors, currently standing at $1.36 per share with 100 consecutive years of payment, are big pluses. The diverse products and consistent dividend are the kind of properties I look for in a stock to buy and hold forever. As consumers, we're spending more and more on entertainment and travel, and that plays right into MGM Resorts' (NYSE:MGM) hands. The company owns some of the gaming world's most valuable properties in Las Vegas, Macau, and across the U.S.
MGM Resorts may be known for gambling, but nearly half of the company's revenue comes off the casino floor -- and in the U.S., the percentage is much higher than 50%. As consumers look for more awe-inspiring entertainment, we'll see nongaming revenue grow. What's great about MGM Resorts is that it's generating billions in cash flow per year from existing resorts. 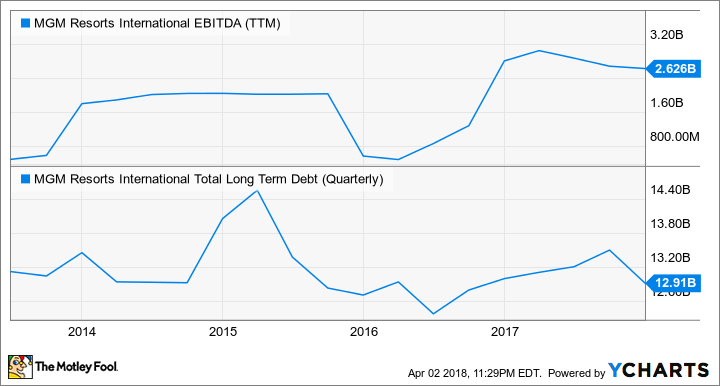 EBITDA is the cash flow proxy above, and debt is slowly declining even as the company grows its casino base with projects like MGM Cotai and MGM National Harbor. I like the long-term trends driving the growth of entertainment and think MGM Resorts will be a winner for investors for decades to come. Few asset managers have a track record like Brookfield Asset Management, which controls major renewable energy, real estate, infrastructure, and private equity businesses. The two that I think are great buys long-term are Brookfield Renewable Partners (NYSE:BEP) and Brookfield Property Partners (NASDAQ:BPY). They own great assets that will generate cash flow for decades and currently have dividend yields of 6.3% and 6.7%, respectively. Brookfield Renewable Partners owns primarily hydroelectric plants that generate consistent cash flow that's then used to pay dividends. But the company has also started buying wind, solar, energy storage, and distributed generation (small plants like rooftop solar) projects as well. Most of these renewable energy projects come with long-term contracts called power purchase agreements to sell electricity to large utilities, ensuring a solid return on the initial investment. With a conservative dividend growth target of 5% to 9% and a goal of generating total returns of 12% to 15% long-term, this is a stock that will generate value for investors as long as the world needs energy. Brookfield Property Partners is an owner of office and retail real estate, generating cash flow from each. The company isn't technically a REIT because it operates around the world, but it functions much the same way. The company has increased funds from operations per unit by 9% annually since it went public and expects to grow more, agreeing to a $15 billion deal to acquire mall owner GGP Inc late last year. The deal is expected to be accretive to Brookfield Property Partners and is the latest move to grow funds from operations per unit long-term. These are both dividend stocks with a long track record of creating value, which is why I think they're worth holding forever. Keeping stocks forever may seem like a long time, but if you're riding industry growth like MGM, invested in a diverse company like 3M, or collecting regular dividends from Brookfield's businesses, forever is a great holding period.